This knife is a collaboration between Rick Hinderer and Zero Tolerance and comes with many of the qualities typically prized in Hinderer’s far more expensive custom knives. 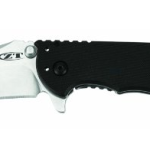 The first thing that most people notice about a ZT 0550 is its size and weight. At 5.8 ounces, it is roughly twice the weight of the typical everyday carry knife and its 3.5-inch blade is large enough to make it look and feel like a weapon. That said, its size and weight do not diminish its usefulness in common tasks. It will still fit in the pocket of your jeans. The next most striking thing about the ZT 0550 is its build-quality. It feels like a knife designed for rough work. To call it sturdy would be an understatement. The blade is 4mm thick and feels more suited for hacking up firewood and use as pry bar than for light-duty tasks like opening mail. The S30V steel used for this blade sharpens easily and holds an edge well. The handle is made from a combination of G10 and titanium and you can buy aftermarket G10 scales in a variety of colors. If you want to see our full review of this knife, click here. This pocket knife is designed not just for military use, but “x-treme” military use as per the description on Ontario Knife Company’s website. The comfortable grip is one of XM-1’s main selling points. It is what will instantly grab your attention when you first hold the knife. It is a thick knife that is designed to provide users with full control whether they are wearing gloves or using it barehanded. Its 3.75-inch blade is robust enough to be useful for a wide variety of tasks and is just shy of 0.19 inches thick. It also has dual thumb studs to make it easy to open with either hand and is available plain or partially serrated. The overall length of the XM-1 is 8 inches and its weight is a whopping 6.5 ounces, but it still manages to fit well in the hand. The XM-1’s handle is made from machined aircraft-grade aluminum scales with a non-slip finish while the blade is made from N690Co stainless steel. The handle features a thumb ramp and finger grooves that improve grip ergonomics. The handle design makes for a knife that is relatively light and that has a low profile. The Sage series from Spyderco pays homage to renowned knife makers. While Michael Walker’s knives influenced the design of the Sage 1, Chris Reeve influences the Sage 2’s design. With this knife, you get many of the qualities that make Chris Reeve’s knives highly sought after. The Sage 2’s overall length is 7 1/8 inches with a 3-inch blade that is 1/8-inch thick. It weighs in at 3.8 ounces. All of this combines to make it an ideal everyday carry knife. The steel used for the Sage 2 is S30V, which is considered by many to be one of the better blade steels available. Its low weight and thick blade make it handy in a variety of situations. It has the distinctive Spyderco leaf shape along with a flat grind that makes it a good slicer. The Sage 2’s handle is what really stands out about this knife. It consists of titanium slabs connected by 3 torx bolts, making it easy to disassemble for cleaning and maintenance. It is extremely light and very well machined. It is only 4 3/16 inches long, but the thumb ramp’s jimping and the choil allow you to choke up on it and maintain a solid grip. This knife was first unveiled at the SHOT show in January 2015, measures 6.69 inches and weighs a scant 2.18 ounces. Overall, the Benchmade Valet 485 checks everything off on the list of what an everyday carry knife should have. The blade features a high flat grind and measures just under 3 inches. 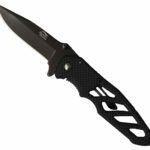 It is made with M390, a super steel that is known for its ability to hold an edge. M390 is also very resistant to corrosion. The Valet’s handle consists of contoured gray G10 on stainless steel liners making for a sleek well-machined look as should be expected from Benchmade. Despite the fact that it is a small knife and despite the fact that it has no jimping, it is still possible to get a solid grip on it. The Pipsqueak was designed by Neil Blackwood of Blackwood Custom Knives, and is another small knife that is ideal for use as an everyday carry. The blade on the Pipsqueak measures 2.6 inches and the knife is 6.15 inches long overall. It weighs in at 4.7 ounces. Its size and weight make it unobtrusive in most pockets but big enough to handle serious work. While the weight may be a bit much for its size, odds are that you probably will not notice it. The blade is made from S35VN and features a hollow primary grind that backs up the well-ground secondary bevel. The handle consists of two slabs of titanium, one of which is covered with green micarta. Despite its relatively small size, the handle is easy to grip and there is jimping on the blade’s spine to give you even better control of the knife.